Pictured are: Back Row – Public Service Director Kevin Aller, Economic Development Director Bill Sanford, Law Director Leslie Brinning, Mayor Craig Stough, Chief William Rhodus, Finance Director Toby Schroyer and Clerk of Council Sharon Bucher. 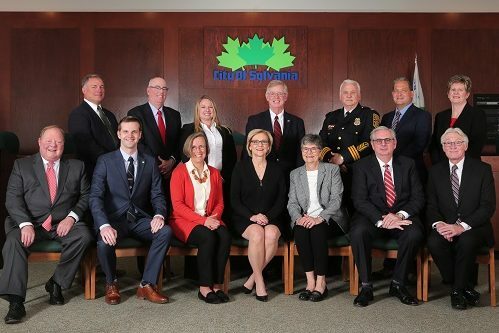 Front Row – Members of Council, Douglas Haynam, Patrick Richardson, Katie Cappellini, President of Council Mary Westphal, Members of Council, Sandy Husman, Mark Frye and Mark Luetke. 6635 Maplewood Ave. 6730 Monroe St.